LX521.4 is a 4-way loudspeaker, designed as full-range dipole, for flat on-axis and off-axis response in the horizontal plane and frontal hemisphere. It requires between 8 to10 power amplifiers of 50 W to 200 W and a miniDSP 4x10HD. The speakers need breathing room of at least 1 m to the nearest large reflecting surfaces and a room with a minimum volume of 65 m3. The LX521.4 eliminates the passive L&C crossover in the LX521 top baffle and brings the speaker to its logical completion. Drivers and baffle design remain unchanged. 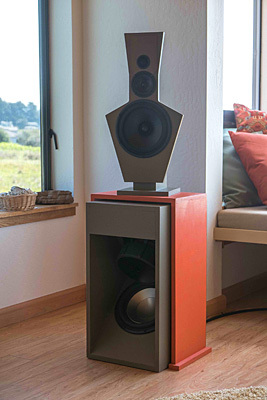 Equalization and crossovers have been redesigned from newly taken acoustic measurements for a lower listening axis. With its clarity, imaging, high dynamics and disappearance from one's auditory illusion, the LX521.4 renders a superb recording probably as good as it gets and delivers a highly enjoyable experience. I am delighted. LX521.4 Construction Plans are an addition to LX521 plans and available to all LX521 plan owners via their Owner Support Page. The LX521 Construction Plans are available as PDF only. I provide access to an Owners Support Page for DSP configuration files, updates and corrections to the LX521 design. Questions for help should be posted on the OPLUG forum. See Terms, Conditions & Blacklist to guarantee that you receive a genuine LINKWITZ LAB product. At the "Reproduced Sound 2015" Conference of the the UK Institute of Acoustics I gave a talk "The Magic in 2-Channel Sound Reproduction - Why is it so rarely heard?"